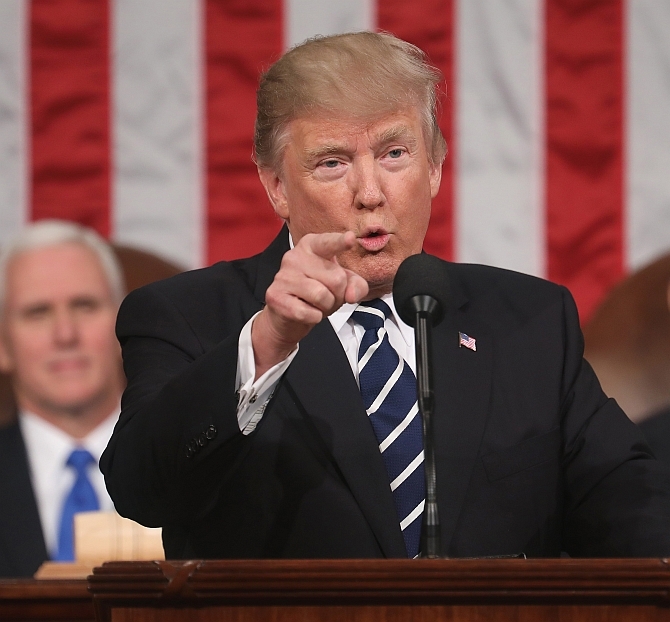 The following is the full text of US President Donald Trump’s first address to a joint session of the Congress on February 28, as prepared for delivery and released by the White House press office. of our nation’s path toward civil rights and the work that still remains. Each American generation passes the torch of truth, liberty and justice – in an unbroken chain all the way down to the present. That torch is now in our hands. And we will use it to light up the world. I am here tonight to deliver a message of unity and strength, and it is a message deeply delivered from my heart. A new chapter of American Greatness is now beginning. And a new surge of optimism is placing impossible dreams firmly within our grasp. What we are witnessing today is the Renewal of the American Spirit. All the nations of the world – friend or foe – will find that America is strong, America is proud, and America is free. In 9 years, The United States will celebrate the 250th anniversary of our Founding – 250 years since the day we declared our Independence. It will be one of the great milestones in the history of the world. But what will America look like as we reach our 250th year? What kind of country will we leave for our children? I will not allow the mistakes of recent decades past to define the course of our future.For too long, we’ve watched our middle class shrink as we’ve exported our jobs and wealth to foreign countries. We’ve financed and built one global project after another, but ignored the fates of our children in the inner cities of Chicago, Baltimore, Detroit – and so many other places throughout our land. We’ve defended the borders of other nations, while leaving our own borders wide open, for anyone to cross – and for drugs to pour in at a now unprecedented rate. And we’ve spent trillions of dollars overseas, while our infrastructure at home has so badly crumbled. Then, in 2016, the earth shifted beneath our feet. The rebellion started as a quiet protest, spoken by families of all colors and creeds – families who just wanted a fair shot for their children, and a fair hearing for their concerns. But then the quiet voices became a loud chorus – as thousands of citizens now spoke out together, from cities small and large, all across our country. Finally, the chorus became an earthquake – and the people turned out by the tens of millions, and they were all united by one very simple, but crucial demand, that America Must Put Its Own Citizens First…because only then, can we truly, MAKE AMERICA GREAT AGAIN. Our terrible drug epidemic will slow down and ultimately, stop. And our neglected inner cities will see a rebirth of hope, safety and opportunity. It’s been a little over a month since my inauguration, and I want to take this moment to update the nation on the progress I’ve made in keeping those promises. Since my election, Ford, Fiat-Chrysler, General Motors, Sprint, Softbank, Lockheed, Intel, Walmart and many others, have announced that they will invest billions of dollars in the United States and will create tens of thousands of new American jobs. The stock market has gained almost three trillion dollars in value since the election on November 8th, a record. We’ve saved taxpayers hundreds of millions of dollars by bringing down the price of the fantastic new F-35 jet fighter, and will be saving billions more dollars on contracts all across our government. We have placed a hiring freeze on non-military and non-essential federal workers. We have begun to drain the swamp of government corruption by imposing a 5 year-ban on lobbying by Executive Branch Officials -- and a lifetime ban on becoming lobbyists for a foreign government. We have undertaken a historic effort to eliminate job-crushing regulations, creating a deregulation task force inside of every government agency; imposing a new rule which mandates that for every 1 new regulation, 2 old regulations must be eliminated; and stopping a regulation that threatens the future and livelihoods of our great coal miners. We have cleared the way for the construction of the Keystone and Dakota Access Pipelines -- thereby creating tens of thousands of jobs -- and I’ve issued a new directive that new American Pipelines be made with American Steel. By finally enforcing our immigration laws, we will raise wages, help the unemployed, save billions of dollars, and make our communities safer for everyone. We want all Americans to succeed – but that can’t happen in an environment of lawless chaos. We must restore integrity and the rule of law to our borders. For that reason, we will soon begin the construction of a Great Wall along our Southern Border. As we speak, we are removing gang members, drug dealers and criminals that threaten our communities and prey on our citizens. Bad ones are going out as I speak tonight and as I have promised. To any in Congress who do not believe we should enforce our laws, I would ask you this question: what would you say to the American family that loses their jobs, their income, or a loved one, because America refused to uphold its laws and defend its borders? According to data provided by the Department of Justice, the vast majority of individuals convicted for terrorism-related offenses since 9/11 came here from outside of our country. We have seen the attacks at home – from Boston to San Bernardino to the Pentagon and yes, even the World Trade Center. We have seen the attacks in France, in Belgium, in Germany and all over the world. It is not compassionate, but reckless, to allow uncontrolled entry from places where proper vetting cannot occur. Those given the high honor of admission to the United States, should support this country and love its people and its values. We cannot allow a beachhead of terrorism to form inside America -- we cannot allow our nation to become a sanctuary for extremists. Finally, I have kept my promise to appoint a Justice to the United States Supreme Court from my list of 20 judges who will defend our Constitution. I am honored to have Maureen Scalia with us in the gallery tonight. Her late, great husband, Antonin Scalia, will forever be a symbol of American Justice. To fill his seat, we have chosen Judge Neil Gorsuch, a man of incredible skill, and deep devotion to the law. He was confirmed unanimously to the Court of Appeals, and I am asking the Senate to swiftly approve his nomination. Tonight, as I outline the next steps we must take as country, we must honestly acknowledge the circumstances we inherited. 94 million Americans are out of the labor force. Over 43 million people are now living in poverty, and over 43 million Americans are on food stamps. More than 1 in 5 people in their prime-working years are not working. We have the worst financial recovery in 65 years. In the last 8 years, the past Administration has put on more new debt than nearly all other Presidents combined. We’ve lost more than one-fourth of our manufacturing jobs since NAFTA was approved, and we’ve lost 60,000 factories since China joined the World Trade Organization in 2001. Our trade deficit in goods with the world last year was nearly $800 billion dollars. And overseas, we have inherited a series of tragic foreign policy disasters. Solving these, and so many other pressing problems, will require us to work past the differences of Party. It will require us to tap into the American Spirit that has overcome every challenge throughout our long and storied history. But to accomplish our goals at home and abroad, we must restart the engine of the American Economy -- making it easier for companies to do business in the United States, and much harder for companies to leave. Right now, American companies are taxed at one of the highest rates anywhere in the world. My economic team is developing historic tax reform that will reduce the tax rate on our companies so they can compete and thrive anywhere and with anyone. At the same time, we will provide massive tax relief for the middle class. We must create a level playing field for American companies and workers. Currently, when we ship products out of America, many other countries make us pay very high tariffs and taxes -- but when foreign companies ship their products into America, we charge them almost nothing. I just met with officials and workers from a great American company, Harley Davidson. In fact, they proudly displayed five of their magnificent motorcycles, made in the USA, on the front lawn of the White House. At our meeting, I asked them, how are you doing, how is business? They said that it’s good. I asked them further how they are doing with other countries, mainly international sales. They told me -- without even complaining because they have been mistreated for so long that they have become used to it -- that it is very hard to do business with other countries because they tax our goods at such a high rate. They said that in one case another country taxed their motorcycles at 100 percent. They weren’t even asking for change. But I am. I believe strongly in free trade but it also has to be FAIR TRADE. The first Republican President, Abraham Lincoln, warned that "The abandonment of the protective policy by the American government will produce want and ruin among our people." Lincoln was right – and it is time we heeded his words. I am not going to let America and its great companies and workers, be taken advantage of anymore. I am going to bring back millions of jobs. Protecting our workers also means reforming our system of legal immigration. The current, outdated system depresses wages for our poorest workers, and puts great pressure on taxpayers. Nations around the world, like Canada, Australia and many others – have a merit-based immigration system. It is a basic principle that those seeking to enter a country ought to be able to support themselves financially. Yet, in America, we do not enforce this rule, straining the very public resources that our poorest citizens rely upon. According to the National Academy of Sciences, our current immigration system costs America’s taxpayers many billions of dollars a year. Switching away from this current system of lower-skilled immigration, and instead adopting a merit-based system, will have many benefits: it will save countless dollars, raise workers’ wages, and help struggling families – including immigrant families – enter the middle class. I believe that real and positive immigration reform is possible, as long as we focus on the following goals: to improve jobs and wages for Americans, to strengthen our nation’s security, and to restore respect for our laws. If we are guided by the well-being of American citizens, instead of the unusual special interests, then I believe Republicans and Democrats can work together to achieve an outcome that has eluded our country for decades. Another Republican President, Dwight D. Eisenhower, initiated the last truly great national infrastructure program – the building of the interstate highway system. The time has come for a new program of national rebuilding. America has spent approximately six trillion dollars in the Middle East, all this while our infrastructure at home is crumbling. With this six trillion dollars we could have rebuilt our country -- twice. And maybe even three times if we had people who had the ability to negotiate. To launch our national rebuilding, I will be asking Congress to approve legislation that produces a $1 trillion dollar investment in the infrastructure of the United States – financed through both public and private capital – creating millions of new jobs. Arizona went up 116% last year alone. Governor Matt Bevin of Kentucky just said Obamacare is failing in his state -- it is unsustainable and collapsing. One third of counties have only one insurer on the exchanges -- leaving many Americans with no choice at all. Remember when you were told that you could keep your doctor, and keep your plan? We now know that all of those promises have been broken. Obamacare is collapsing -- and we must act decisively to protect all Americans. Fourth, we should implement legal reforms that protect patients and doctors from unnecessary costs that drive up the price of insurance — and work to bring down the artificially high price of drugs, and bring them down immediately. Finally, the time has come to give Americans the freedom to purchase health insurance across state lines – creating a truly competitive national marketplace that will bring cost way down and provide far better care. Everything that is broken in our country can be fixed. Every problem can be solved. And every hurting family can find healing, and hope. Our citizens deserve this, and so much more – so why not join forces to finally get it done? On this and so many other things, Democrats and Republicans should get together and unite for the good of our country, and for the good of the American people. My administration wants to work with members in both parties to make childcare accessible and affordable, to help ensure new parents have Paid Family Leave, to invest in women’s health, and to promote clean air and clear water, and to rebuild our military and our infrastructure. True love for our people requires us to find common ground, to advance the common good, and to cooperate on behalf of every American child who deserves a brighter future. An incredible young woman is with us this evening who should serve as an inspiration to us all. Today is Rare Disease day, and joining us in the gallery is a Rare Disease Survivor, Megan Crowley. Megan was diagnosed with Pompay Disease, a rare and serious illness when she was 15 months old. She was not expected to live past five. On receiving this news, Megan’s dad, John, fought with everything he had to save the life of his precious child. He founded a company to look for a cure, and helped develop the drug that saved Megan’s life. Today she is 20 years old -- and a sophomore at Notre Dame. Megan’s story is about the unbounded power of a father’s love for a daughter. But our slow and burdensome approval process at the Food and Drug Administration keeps too many advances, like the one that saved Megan’s life, from reaching those in need. If we slash the restraints, not just at the FDA, but across our government, then we will be blessed with far more miracles like Megan. In fact, our children will grow up in a nation of miracles. But to achieve this future, we must enrich the mind – and the souls – of every American child. Education is the civil rights issue of our time. I am calling upon members of both parties to pass an education bill that funds school choice for disadvantaged youth, including millions of African-American and Latino children. These families should be free to choose the public, private, charter, magnet, religious or home school that is right for them. Joining us tonight in the gallery is a remarkable woman, Denisha Merriweather. As a young girl, Denisha struggled in school and failed third grade twice. But then she was able to enroll in a private center for learning with the help of a tax credit scholarship program. Today, she is the first in her family to graduate not just from high school, but from college. Later this year she will get her masters degree in social work. We want all children to be able to break the cycle of poverty just like Denisha. But to break the cycle of poverty, we must also break the cycle of violence. The murder rate in 2015 experienced its largest single-year increase in nearly half a century. In Chicago, more than 4,000 people were shot last year alone -- and the murder rate so far this year has been even higher. This is not acceptable in our society. Every American child should be able to grow up in a safe community, to attend a great school, and to have access to a high-paying job. But to create this future, we must work with – not against – the men and women of law enforcement. We must build bridges of cooperation and trust – not drive the wedge of disunity and division. Police and sheriffs are members of our community. They are friends and neighbors, they are mothers and fathers, sons and daughters – and they leave behind loved ones every day who worry whether or not they’ll come home safe and sound. We must support the incredible men and women of law enforcement. And we must support the victims of crime. I have ordered the Department of Homeland Security to create an office to serve American Victims. The office is called VOICE – Victims Of Immigration Crime Engagement. We are providing a voice to those who have been ignored by our media, and silenced by special interests. Joining us in the audience tonight are four very brave Americans whose government failed them. Their names are Jamiel Shaw, Susan Oliver, Jenna Oliver, and Jessica Davis. Jamiel’s 17-year-old son was viciously murdered by an illegal immigrant gang member, who had just been released from prison. Jamiel Shaw Jr. was an incredible young man, with unlimited potential who was getting ready to go to college where he would have excelled as a great quarterback. But he never got the chance. His father, who is in the audience tonight, has become a good friend of mine. Also with us are Susan Oliver and Jessica Davis. Their husbands – Deputy Sheriff Danny Oliver and Detective Michael Davis – were slain in the line of duty in California. They were pillars of their community. These brave men were viciously gunned down by an illegal immigrant with a criminal record and two prior deportations. Sitting with Susan is her daughter, Jenna. Jenna: I want you to know that your father was a hero, and that tonight you have the love of an entire country supporting you and praying for you. To Jamiel, Jenna, Susan and Jessica: I want you to know -- we will never stop fighting for justice -- your loved ones will never be forgotten, we will always honor their memory. Finally, to keep America Safe we must provide the men and women of the United States Military with the tools they need to prevent war and – if they must – TO FIGHT AND TO WIN. I am sending Congress a budget that rebuilds the military, eliminates the Defense Sequester, and calls for one of the largest increases in national defense spending in American history. My budget will also increase funding for our Veterans. Our Veterans have delivered for this nation – and now we must deliver for them. The challenges we face as a nation are great. But our people are even greater. And none are greater or braver than those who fight for America in uniform. We are blessed to be joined tonight by Carryn Owens, the widow of a U.S. Navy Special Operator, Senior Chief William “Ryan” Owens. Ryan died as he lived: a warrior, and a hero – battling against terrorism and securing our nation. Ryan’s legacy is etched into eternity. For as the bible teaches us, there is no greater act of love than to lay down one’s life for one’s friends. Ryan laid down his life for his friends, for his country, and for our freedom – we will never forget him. To those allies who wonder what kind of friend America will be, look no further than the heroes who wear our uniform. Our foreign policy calls for a direct, robust and meaningful engagement with the world. It is American Leadership based on vital security interests that we share with our allies across the globe. We strongly support NATO, an alliance forged through the bonds of two World Wars that dethroned fascism, and a Cold War that defeated communism. But our partners must meet their financial obligations. And now, based on our very strong and frank discussions, they are beginning to do just that. We expect our partners, whether in NATO, in the Middle East, or the Pacific – to take a direct and meaningful role in both strategic and military operations, and pay their fair share of the cost. We will respect historic institutions, but we will also respect the sovereign rights of nations. Free nations are the best vehicle for expressing the will of the people – and America respects the right of all nations to chart their own path. My job is not to represent the world. My job is to represent the United States of America. But we know that America is better off, when there is less conflict — not more. We must learn from the mistakes of the past – we have seen the war and destruction that have raged across our world. The only long-term solution for these humanitarian disasters is to create the conditions where displaced persons can safely return home and begin the long process of rebuilding. America is willing to find new friends, and to forge new partnerships, where shared interests align. We want harmony and stability, not war and conflict. We want peace, wherever peace can be found. America is friends today with former enemies. Some of our closest allies, decades ago, fought on the opposite side of these World Wars. This history should give us all faith in the possibilities for a better world. Hopefully, the 250th year for America will see a world that is more peaceful, more just and more free. On our 100th anniversary, in 1876, citizens from across our nation came to Philadelphia to celebrate America’s centennial. At that celebration, the country’s builders and artists and inventors showed off their creations. Alexander Graham Bell displayed his telephone for the first time. Remington unveiled the first typewriter. An early attempt was made at electric light. Thomas Edison showed an automatic telegraph and an electric pen. Imagine the wonders our country could know in America’s 250th year. Think of the marvels we can achieve if we simply set free the dreams of our people. Cures to illnesses that have always plagued us are not too much to hope. American footprints on distant worlds are not too big a dream. Millions lifted from welfare to work is not too much to expect. And streets where mothers are safe from fear— schools where children learn in peace— and jobs where Americans prosper and grow— are not too much to ask. 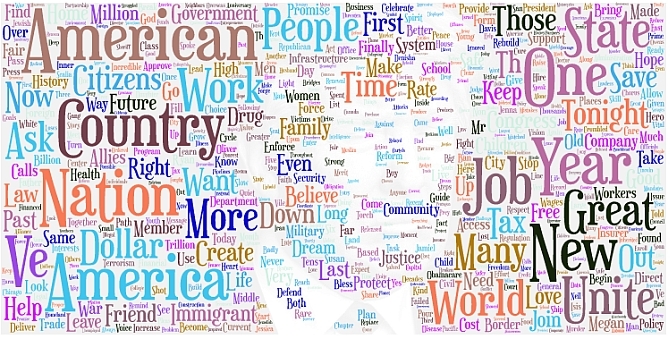 When we have all of this, we will have made America greater than ever before. For all Americans. This is our vision. This is our mission. But we can only get there together. We are one people, with one destiny. We all bleed the same blood. We all salute the same flag. And we are all made by the same God. And when we fulfill this vision; when we celebrate our 250 years of glorious freedom, we will look back on tonight as when this new chapter of American Greatness began. The time for small thinking is over. The time for trivial fights is behind us. We just need the courage to share the dreams that fill our hearts. The bravery to express the hopes that stir our souls. And the confidence to turn those hopes and dreams to action. From now on, America will be empowered by our aspirations – not burdened by our fears. …Inspired by the future – not bound by the failures of the past. …And guided by our vision – not blinded by our doubts. I am asking all citizens to embrace this Renewal of the American Spirit. I am asking all members of Congress to join me in Dreaming Big, and Bold and Daring things for our country. And I am asking everyone watching tonight to seize this moment and– Believe In Yourselves. Believe In Your Future. And Believe, Once More, In America. God bless you, and God Bless these United States.